12 BOX Factory Sealed Hobby CASE. Look for (1) Autographed Rookie Card per box! Configuration: 12 Boxes Per Case. AUTOGRAPHED ROOKIE CARDS - 1 PER HOBBY BOX! Rookie Autographs - Forty gifted NFL Rookies from the base set with their signatures on a variation card. Available in the following numbered Refractor Parallel versions: - Superfractor - ONE OF ONE! RED - numbered to 5. Gold - Numbered to 10 - Black - Numbered to 25 - NEW! CRYSTAL ATOMIC - numbered to 50. Refractor - Numbered to 99 Rookie Autograph Patches - Each card features a vari-colored jersey patch along with a signature from each of 36 NFL Rookies. Dual Rookie Autographs - These cards flaunt 2 Rookies with 2 signed monikers. Triple Rookie Autographs - A Rookie and autograph trio! Autograph Rookie Variations - 25 Rookies and their signatures shine on Rainbow Refractor cards. INSERT CARDS - 9 PER HOBBY BOX! Bowman Chrome: 30 rookies featured on a limited edition Chromed 2011 Bowman Football design. Also available in a numbered to 99 Refractor version Bowman Chrome On-Card Autograph Refractor Parallel: The same 30 subjects personally sign their cards with an autograph. Bowman Chrome Autograph Refractor Patch Parallel: Each of the above Rookies with an autograph and a patch piece and numbered to 10. Superlative Rookies: 36 Rookies on Die-Cut Refractor cards. Available in the following Parallel Refractor versions:SUPERFRACTOR - ONE OF ONE! RED - numbered to 25 BLUE - numbered to 50 New! Superlative Rookies Autographs: All 36 rookies with their signatures on ONE OF ONE cards. Finest Freshmen: From the NFL Rookie Premiere, 36 of the most promising 2011 Rookies. Available in the following Parallel Refractor versions: - DIE-CUT CRYSTAL - numbered to 50 - GOLD - numbered to 75 - REFRACTOR - numbered to 99 New! Finest Freshmen Autographs: The same 36 rookies with their signatures. Rookie Refractor Recognition: 36 Rookies display their team allegiances. On-Card Autographed Refractor Rookie Recognition: Each Rookie signs his cards! BASE CARDS - 4 PER HOBBY PACK! Veterans - 110 glittering NFL pros. Rookies - 110 gifted newcomers 1 PER PACK! Rookie Base Card Variations - 25 short-print rookie subjects PARALLEL BASE CARDS - 9 PER HOBBY BOX! All 220 players from the Base Set are paralleled: - Superfractor - ONE OF ONE! RED - numbered to 25. Gold - numbered to 50 - NEW! SEPIA - numbered to 99. Blue - numbered to 199 - NEW! BLACK - numbered to 299 - Refractor - numbered - Printing Plates - Four plates from each of the 220 base cards, ONE OF ONE! 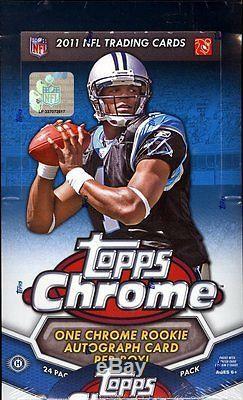 The item "2011 Topps Chrome Football Factory Sealed 12 Box Hobby Case 12 Auto RCs a Box" is in sale since Saturday, October 13, 2012.